Endemic to South Africa, the Cape parrot, or Poicephalus robustus, lives in the Afromontane yellowwood forests found mainly in the Eastern Cape and KwaZulu Natal. Over the last 50-100 years the population has decreased dramatically. They are considered critically endangered. Only 1600 remain in the wild. In other words, you have more chance of sighting a white rhino, in South Africa, than you do a Cape parrot. The Cape parrot is a large bird, roughly 34 cm in height, with an average weight of 260-330g. Their head and neck colours are bright gold mixed with dark brown, their backs and wings are dark green, their rumps and underparts bright green, sometimes with a hint of blue. The females sport an orange-red blaze across the crowns of their heads. They’re also loud, particularly when feeding or flying, and you will hear their high-pitched screech even before you see them. It is the country’s only endemic parrot, as well as one of the country’s most endangered bird species. The loss of this green and gold bird from our last remaining patches of Afromontane forest is a sign of how out of balance nature, and man’s continuous pursuit for economic growth, has become. South Africa’s yellowwood dominated forests are all but gone due to historical harvesting for timber. What remains of the once impressive old-growth yellowwood forest patches that existed along our coastline, and in our mountains, is nominal. Thousands of large, tall yellowwood trees once commanded the canopy of the Afromontane yellowwood forest patches along South Africa’s south coast from George to Humansdorp, through the Eastern Cape, former Transkei and southern Drakensberg all the way north to the Magoebaskloof in Limpopo. Whilst yellowwoods are officially protected today, legal permits allow sawmills to continue harvesting an annual quota. Most of these are over 150 to 200 years old. We cannot replace them. Yellowwood poaching is rife, and only a handful of trees remain over 500 years of age. As Steve Boyes of the Parrot Project so aptly says in his open letter to the president on the state of the country’s yellowwood forests, written for National Geographic: ‘We protect buildings over 100-years-old. Why do we not do this for trees?’. PBFD is a serious threat to the Cape parrot. It is an epidemic that erupts every winter, made worse by mild droughts and early cold snaps. It is similar to the HIV virus and the symptoms of AIDS in the sense that parrots can have the virus but fail to exhibit the PBFD symptoms when on a healthy diet. Interestingly, it is the shortage of yellowwood fruits specifically that has very likely contributed to the strength of the virus–the fruits have strong anti-microbial qualities. PBFD is a virus that causes the immune system to falter. The parrots slowly become too weak to fight the virus, which takes hold because of a lack of suitable food, between January and March every year. After moulting their feathers grow back deformed. They are not able to fly as well; some cannot fly at all. And they cannot manage to salvage enough food. The combination of starvation and exposure to cold is what kills them. Up to 60% of the parrot population could be infected at any one time, according to the Cape Parrot Project, who are working to protect the Cape parrot. Other projects in support of the Cape parrot includes the research by Colleen Downs and her colleagues, who recently identified the Cape parrot as a species genetically distinct from its closest relatives, emphasising the need to save the few remaining individuals. A grant from the National Geographic Society Conservation Trust allowed the Cape Parrot Project (working collaboratively with UCT laboratory, who does the testing of the virus) to assess the full impact of PBFD in 2010 and 2011 with alarming results – up to 100% of the blood samples taken revealed the virus. In 2011, 10% of the population of Cape parrots around Hogsback was believed to have died. 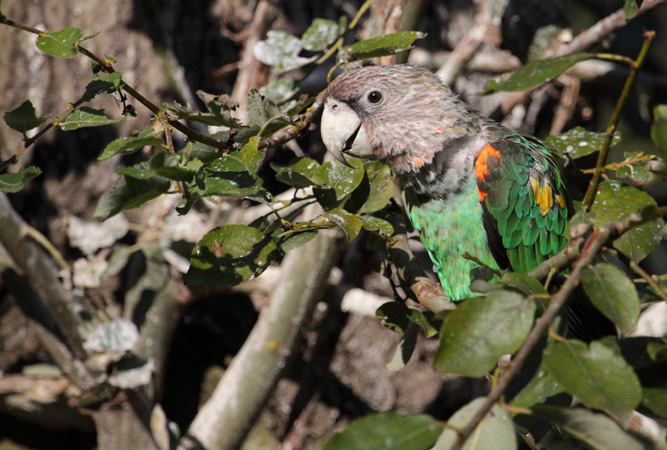 The project, which also intends providing supplementary food on feeding decks to help the parrot fight the virus, is currently focused on planting thousands of indigenous trees and Cape parrot ‘orchards’ across the Amathole mountain range. These orchards will provide food for the parrots within 7-10 years. The project actively involves the local community surrounding the indigenous forest in growing indigenous trees (particularly yellowwood)and germinating seeds, which they then replant into the forest on sites cleared of exotic and invasive plant species. Cape parrot nest boxes is another way the project is working to help the parrot make up for the shortage of nest cavities, as dying and dead indigenous hardwoods, like yellowwods, are removed from the forest for furniture production. 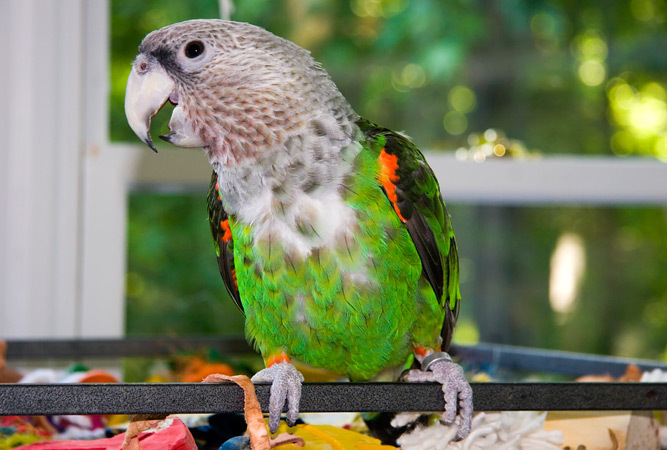 Parrots around the world are subject to illegal trading – captured in nets and then sold to markets for the pet trade. 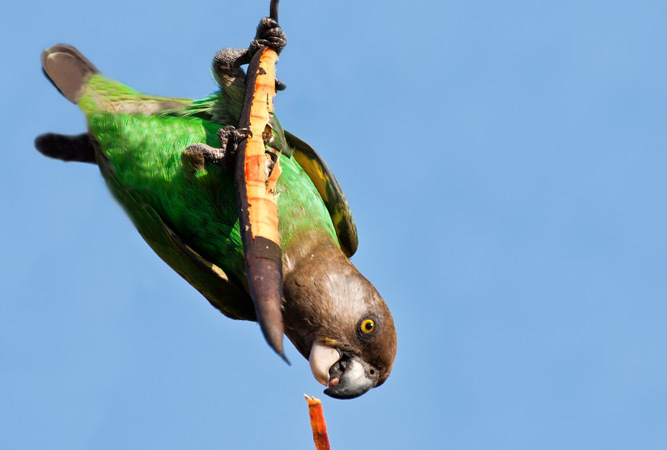 The Cape parrot is no exception, and many of them have been illegally traded. Just do a Google search for ‘Cape parrot for sale’, and you won’t come up empty handed. The Cape parrot lives in the Afromontane southern mistbelt forests from Hogsback in the Eastern Cape through to the Balgowan and Karkloof areas of KwaZulu Natal. There is also a small population in the Magoebaskloof. In the last annual count (April 2015) there were 459 Cape parrots in KZN, 427 in the former Transkei, 554 in the Eastern Cape and 68 in Limpopo. This is higher than the count in 2013 when the maximum count was 1344. Hogsback – The Cape Parrot Project is based at the iZingcuka Forest Station close to Hogsback. Contact them for tips on how best to see this bird in the wild. Coastal forests between Mboyti to Port St Johns – although they are restricted to Afromontane forests, the Cape parrot is highly mobile and often visits commercial orchards and sometimes coastal forests, like these. Fort Fordyce / Stutterheim area, Eastern Cape – around 350 parrots have been sighted in the area. Hlabeni State Forest, KZN – this forest forms part of the mistbelt mixed Afromontane forests; although sightings are unpredictable, and the numbers vary year upon year. Weza-Ngele Forest, KZN – is one of the biggest portions of Afromontane forest in KwaZulu Natal and home to the Cape parrot. Stay overnight and walk the forest at dawn, or late afternoons when the parrots return to their roosting sites. Dargle Conservancy, KZN – flocks of Cape parrots are a regular sighting, early morning and at dusk. Gxalingele Forest, KZN – large numbers have been sighted here. Magoebaskloof – Cape parrots are often sighted early morning or late afternoon. Thanks to Dr Kirsten Wimberger of the Cape Parrot Project for her contribution. The Cape Parrot Project was initiated in 2009 in a bid to save the Cape parrot from extinction. To learn more visit their Facebook page (facebook.com/groups/capeparrotproject/) . You can get involved by donating via the World Parrot Trust (parrots.org/projects/cape-parrot).